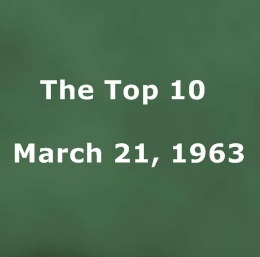 Let’s go back exactly 56 years to March 21, 1963 and check out the Top 10 songs on the Billboard Hot 100. Wow! Talk about bringing back memories…such a great mix Ray! Ray, Penny, Suzanne, Nancy and Barbara have said everything I want to say in addition to the joy of dancing to this 🎼 music 🎶. 😍!!!! The innocent years! Thank you! thank you for the great selection! singing all day! Hope you’re enjoying March Madness as much as I’m enjoying these great songs Ray. I’ve just shared them with lots of friends from the class of ’68 at Hartford High, my brother, his wife and other great friends. Thanks for your energy and work putting this group of songs together!! Janie, my brackets are busted (big time) in the Men’s tourney but I’m doing very well with my picks in the Women’s brackets.